BSA / Triumph etc. all 375 Monobloc Carbs. The inlet is slightly oversize, but will clamp down. 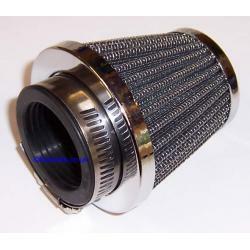 The filter is approximately 75mm at it's widest point tapering down to approximately 50mm. The overall length is 80mm from back to front. The end caps of the filter have a nice deep chrome finish.